I arrange and host Guided Islay Fly Fishing Experiences throughout the season. When you join me on Islay you will enjoy a week of top quality guided angling in the most breathtaking scenery Scotland has to offer. Why Join us for a Guided Islay Fly Fishing Experience? This is an exclusive opportunity to join myself, David Wood, former Caol Ila Distillery Manager, and one of a number of experienced local guides for a week of fly fishing in spectacular scenery, searching out the wildest of Hebridean hill lochs for brown trout and the saltwater for the ellusive sea trout. I have spent years getting to know the wild lochs of Islay, discovering the haunts of sea trout, and learning how to match the hatch on these beautiful seldom visited waters. During this week long trip, as our guest you will be part of a small group of only four anglers. We like to keep the groups small so that everyone spends plenty of time with a guide to ensure that each guests gets the best possible experience. For those anglers who enjoy a dram or two, there are no less than 9 iconic malt whisky distilleries on Islay, I used to be distillery manager at the largest of them all so I make the perfect host for the whisky enthusiast! Theres plenty more info about our services below but if you would like to contact us to make an enquiry, please complete the form below and we’ll be back to you very quickly! There are dozens of hill lochs to choose from on Islay, some more remote than others, all in breathtaking surroundings. It is not uncommon to see osprey fishing whilst on the loch and Islay has fast become the eagle island with regular sightings of golden and white tailed sea eagle. We fish the lochs from boat and from bank. 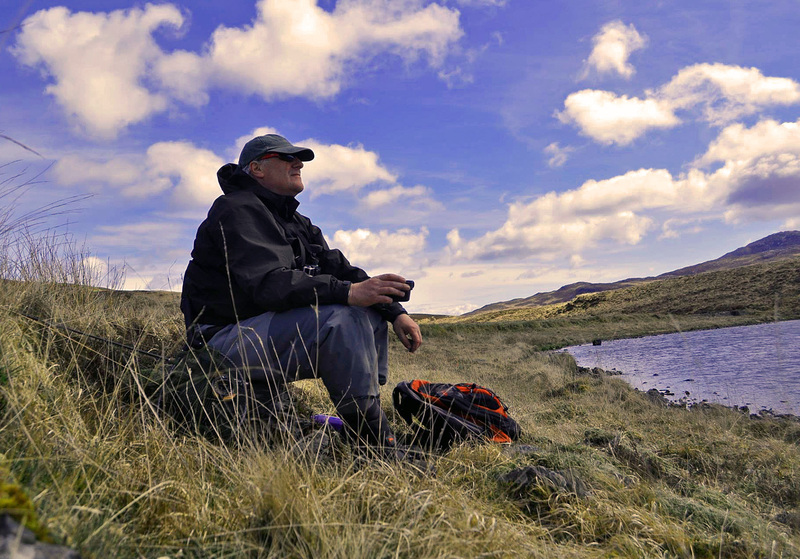 During the week there is the opportunity to head out with a guide for one of the very remote hill lochs to search out a wee monster fish or two. Islay is an incredible place to fish for sea trout. The fishing is very much tide dependent but we are usually able to give guests a chance to target and maybe even catch a beautiful Islay sea trout. We can arrange salmon fishing on Islay on some of the finest river beats on the island. When you join us on Islay during the salmon season, a day or two salmon fishing can be included in your itinerary to fit around the brown trout and sea trout fishing. Accommodation fully stocked with food and a few drams. We all help out during the week with cooking and clearing up. The cost per head for our scheduled trips in 2019 is £1350. This is based on all the above benefits. Extra activities such as stalking, fast RIB sea safaris, shooting and distillery masterclasses may be added for an extra cost. Guests are asked to make their own travel arrangements to get to Islay. We can offer advice on this if required. We also strongly suggest that guests take out their own travel insurance to cover any ferry / plane cancellations or travel disruption which may prevent them from reaching Islay. We arrange bespoke experiences for groups of friends or for work colleagues. Prices depend on the size of the group and which activities they would like to enjoy. Please contact us if you would like more information about us arranging and hosting a bespoke trip for you. We also arrange bespoke Guided Islay Distillery Experiences. Please click here to visit our sister site, www.distilledevents.co.uk, for more information. Slainte and tight lines all! We are now taking bookings for our Guided Islay Fly Fishing Experience in April. Stay in luxurious accommodation for a week and enjoy fly fishing on remote hill lochs with local guides for a whole week. Contact for dates of our Guided Islay Fly Fishing Experiences in April 2019. We arrange and host Guided Islay Fly Fishing Experiences throughout the fishing season. When you join us on Islay you will enjoy a week of top quality guided angling in the most breathtaking scenery Scotland has to offer. If you would like more information about our Guided Islay Fly Fishing Experiences complete the form below and we will get back to you as soon as possible. For those anglers who enjoy a dram or two, there are no less than 8 iconic malt whisky distilleries on Islay, I used to be distillery manager at the largest of them all so I make the perfect host for the whisky enthusiast! If you would like to join one of our future Guided Islay Fly Fishing Experiences, or if you would like more info about what to expect from our trips please get in touch by calling David on 07875 405 980 or fill in the contact form below and we will reply to you very quickly. We offer week long guided fly fishing experiences as well as single day guided fishing on the Hebridean Isle of Islay. Islay is the destination for the travelling angler who wants to enjoy the best of Scottish brown trout, sea trout, and salmon fishing in beautiful surroundings. Fishing is offered on a number of estates from both bank and from boat. If you are coming to Islay for a holiday or for a short break, employing the services of a fishing guide can pay dividends where time is limited and you want to get the very best from your fishing session. Our guides on Islay have years of experience on the lochs and know how to find the fish and match the hatch. Selecting the correct fly patterns for the time of year and conditions is essential if you want to catch fish. We arrange your fishing permits and if you prefer to fish from boat rather than bank we arrange that too. If you are travelling light and have no tackle with you, we can provide rods, reels, lines and flys. Whether you are an experienced angler or new to fly fishing, we’ll make sure that you get the very best out of your day’s fishing on Islay and try our very best to get you in to the fish. If you would like to enquire about our guiding trout fishing services on Islay, please complete the form below and we will get back to you as soon as possible. Islay has dozens of lochs to choose from on different estates. Some lochs are classic upland hill lochs, open to the elements and in truly wild locations. Some anglers enjoy the challenge of a good hike to a remote hill loch to fish for trout that seldom see an artificial fly. Other lochs are tree lined on the sporting estates where the woodlands are managed habitat for woodcock and other game birds. For those anglers who enjoy fishing from a boat, again there are many lochs to choose from and we can arrange this for you. We hope that you will spend a day fly fishing with us on Islay. We also arrange short breaks and week long trips for small groups of anglers. We can provide accommodation, food, tackle and local fishing guides to ensure you have the fishing trip of a lifetime on Islay. Please click here for more information about our Guided Islay Fly Fishing Experiences. We hope to see you on Islay soon! Would you like to enjoy some fantastic fly fishing for the wildest of brown trout and sea trout on the beautiful Hebridean whisky Isle of Islay? We offer guided fly fishing from both bank and boat on either a daily or week long basis. Whether you are an experienced angler or new to fly fishing we offer professional guiding services, providing all your tackle if needed and arranging all of your permits for you. We can arrange fly fishing from both bank and boat on some of the most beautiful lochs Islay has to offer. This is a very special opportunity to join us for a week of fly fishing in spectacular scenery, searching out the wildest of Hebridean hill lochs for brown trout and the saltwater for the elusive sea trout. As former Distillery Manager of Caol Ila Distillery on Islay, I make the perfect host for our guests who enjoy a dram or two. Coupled with our expert local guides, our team is the best available to help ensure you get the most from your fishing holiday on Islay. Accommodation fully stocked with food and a few drams. We fish the lochs from boat and from bank. During the week there is the opportunity to head out for one of the very remote hill lochs to search out a wee monster fish or two. Islay is an incredible place to fish for sea trout. Our guides know the most likely spots to be holding fish at different tide states, at each time in the season. We always fish for sea trout with the fly rod and catches of fish of 4lb and above is not uncommon. The fishing is very much tide dependent but we are usually able to give guests a chance to target and maybe even catch a beautiful Islay sea trout. There are currently 8 whisky distilleries on Islay, by 2020 there will be 10. We can arrange distillery visits on your behalf, it is great to visit the place of where your favourite dram was created and matured. 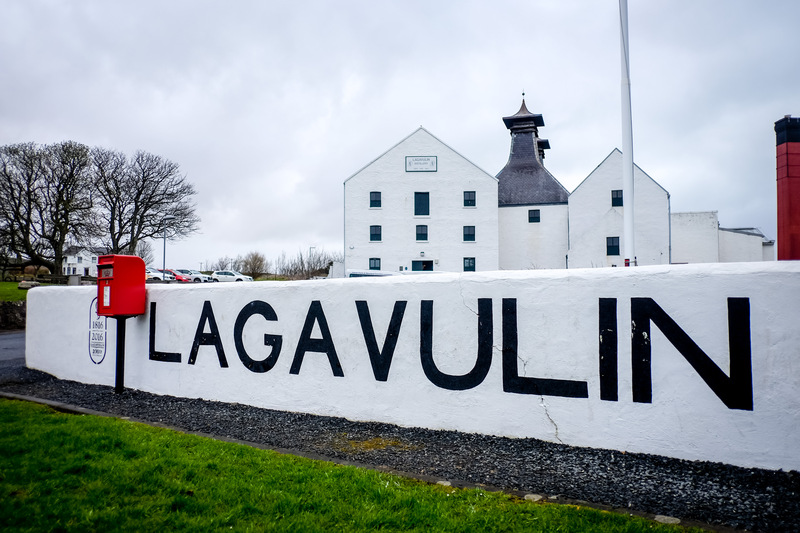 Islay is home to some of the best single malt whisky brands in the world. Laphroaig, Lagavulin and Ardbeg distilleries can be found on the Kildalton Coast of Islay, Bruichladdich and Kilchoman on the West side of the island and Caol Ila and Bunnahabhain to the North. Every distillery makes fantastic whisky and whether you like big peaty, smokey whisky or light fruity drams, there is something for every whisky drinker. If you would like to enquire about our Guided Islay Fly Fishing Experience in May or if you would like to us to arrange bespoke trip for you and your friends, either call David on 07875 405 980, or complete the contact form below and we will get back to you as soon as possible. We are now taking bookings for our Guided Islay Fly Fishing Experience commencing 12th May 2018. Join us for a fishing trip of a lifetime on the beautiful Scottish island of Islay famed for top quality fishing and 8 iconic malt whisky distilleries! This is an exclusive opportunity to join us for a week of fly fishing in spectacular scenery, searching out the wildest of Hebridean hill lochs for brown trout and the saltwater for the elusive sea trout. As former Distillery Manager of Caol Ila Distillery on Islay, I make the perfect host for our guests who enjoy a dram or two. Coupled with our expert local guides, our team is the best available to help ensure you get the most from your fishing holiday on Islay. We are just back from another fantastic Guided Fly Fishing Experience on the beautiful and remote Isle of Islay. Four guests enjoyed fantastic fishing for wild brown trout and sea trout in the hill and sea lochs of Islay. Our guests caught plenty of fish and to top it all the weather was good for the time of year, proving the miserable weather man totally wrong! Our guests enjoyed a full week of extremely varied, guided fly fishing. Our guide for the week was Wychwood’s Glen Pointon who put our guests through their paces on the lochs, matched the hatch and found the fish. We fished quite a few favourite locations including sea trout marks and hill lochs on various estates. Among our guests was Kenneth Halley who has a great fishing website and blog called The Unfamous Fly. Click here to visit his site and read his write up about our trip. Among the venues for our fishing during the week was a favourite hill loch. Glen took two of our guests on the long walk up the hill, enjoying fantastic views along the way. There was some fantastic fishing on both dry and wet fly and they connected with a fair few large brown trout, bringing a couple of lovely specimens to the net. We are now taking bookings for our Guided Islay Fly Fishing Experience commencing 12th May 2018, we have 2 places left. Join us on for a fishing trip of a lifetime on the beautiful Scottish island of Islay famed for top quality fishing and 8 iconic malt whisky distilleries. Please email David at flyfishislay@gmail.com to book your place or for more info. This is an exclusive opportunity to join us for a week of fly fishing in spectacular scenery, searching out the wildest of Hebridean hill lochs for brown trout and the saltwater for the elusive sea trout. During this week long trip, as our guest you will be part of a small group of only four anglers. We like to keep the groups small so that everyone spends plenty of time with our of guide to ensure that each guests gets the best possible experience. For those anglers who enjoy a dram or two, there are no less than 8 iconic malt whisky distilleries on Islay, David used to be distillery manager at the largest of them all so is the perfect host for the whisky enthusiast! If you would like more information about our Guided Islay Fly Fishing Experiences please click here. If you have any questions or if you would like to book with us, please contact us here. This is an exclusive opportunity to join us for a week of fly fishing in spectacular scenery, searching out the wildest of Hebridean hill lochs for brown trout and the saltwater for the ellusive sea trout. During this week long trip, as our guest you will be part of a small group of anglers. We like to keep the groups small so that everyone spends plenty of time with the local guide to ensure that each guests gets the best possible experience. During our Guided Islay Fly Fishing Experience in April 2017, we were interviewed by Rob Marsden from The Yorkshire Gent Website. The interview was conducted over the phone which adds to the remote feel. The photos on this blog post were all taken during that trip. Listen to The Yorkshire Gent podcast here. If you would like to join us in May 2018, or if you would like us to host a Guided Islay Fly Fishing Experience for you and your group of friends, please contact us here. PLEASE NOTE THIS TRIP IS NOW FULLY BOOKED. WE ARE NOW TAKING BOOKINGS FOR OUR MAY TRIP, PLEASE EMAIL FOR MORE INFO. We are now taking bookings for our Guided Fly Fishing Experience commencing Saturday 21st April 2018. Please email David at flyfishislay@gmail.com to book your place or for more info. This is an exclusive opportunity to join Wychwood Game’s Glen Pointon and former Islay Distillery Manager for a week of fly fishing in spectacular scenery, searching out the wildest of Hebridean hill lochs for brown trout and the saltwater for the ellusive sea trout. During this week long trip, as our guest you will be part of a small group of only four anglers. We like to keep the groups small so that everyone spends plenty of time with each of the guides to ensure that each guests gets the best possible experience. We fish the lochs from boat and from bank. During the week there is the opportunity to head out with Glen for one of the very remote hill lochs to search out a wee monster fish or two. Listen to The Yorkshire Gent podcast with Glen and David here. Our first Guided Islay Fly Fishing Experience of 2017! Well that’s Glen and I just back from Islay, and what a truly amazing week of fishing it was. Our four guests enjoyed awesome fishing, and unexpectedly incredibly good weather too! For many anglers, fly fishing on Islay is a dream come true, particularly when they realise there are also 8 whisky distilleries on the island to visit and enjoy. Two of the group drove all the way from Moscow in a Landrover Defender, certainly the furthest anyone has ever driven to join one of our Guided Fly Fishing Experiences. For the last few seasons, April has provided us with tremendous sport on the lochs and in the salt. Even though the air temperature was typically around 8 degrees, and the wind was a biting one, the fish were free rising and plentiful. Catching rising fish during a snow storm will be a memory that stays with our guests for a while! The lochs are full to the brim of water, higher than I have seen for a long time. I’ve heard it said that the fishing can be tough in these conditions, but we experienced the opposite. We find that whilst these conditions would mean few fish on the mainland and further south, the Islay troots are full on the feed. April is also the time when sea trout start to show around the shores of Islay, whereas most other places in the UK won’t see any for a while yet. We provide our guests with a box packed with fly patterns which we think appropriate for the time of year. On this trip we had provided the following patterns; bibio, black & peacock spider, LTD sedge, bibio sedgehog, snatcher and jingler. Guests also had the opportunity to tie a few patterns of their own during the evenings, guided by our Glen. On one loch in particular we watched hatch after hatch of pond olives, the trout locking on to them and hammering them in the warm afternoon sun. We found as well as olive patterns, bibio and snatchers were readily taken by the hungry brownies. 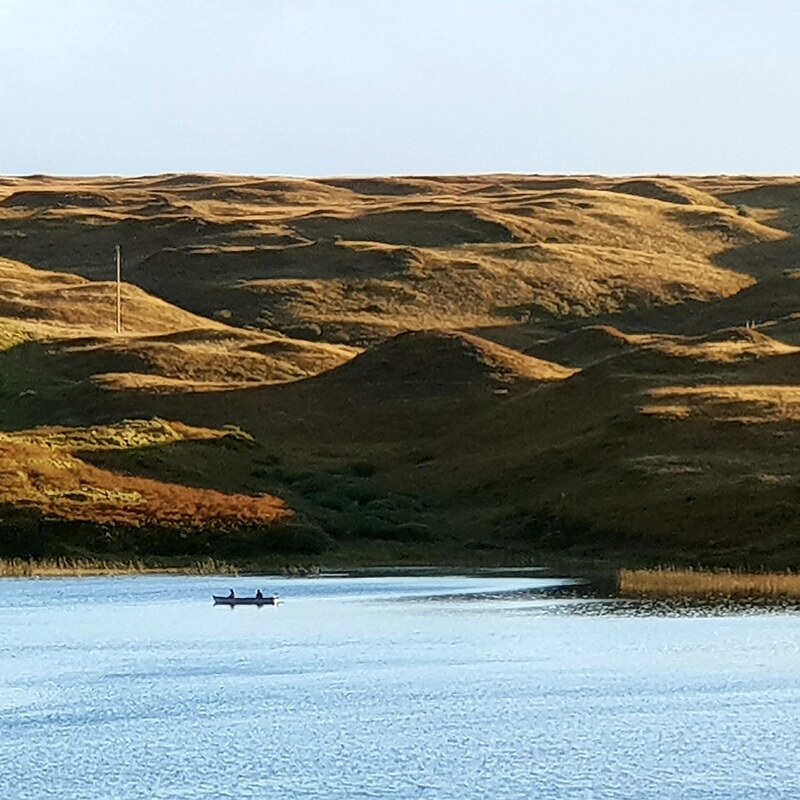 Our fishing during the week was focussed on Loch Skerrols where guests had access to a boat, Loch Finlaggan, Loch Drolsay and a small loch on Dunlossit Estate. Conditions were different at each, the more sheltered lochs like Skerrols providing the best sport. Finlaggan looked incredibly windswept and moody, ideal conditions for some but to us seemed a little too early in the season for such an unsheltered hill loch. On Wednesday last week our itinerary showed us due to make the long walk up Glen Drolsay to the loch of the same name way up in the hills. This difficult two hour walk was a little daunting for some so Glen took one keen guest on the outing, both hoping that one of the rare, large brownies would put in an appearance. Our angling guest was soon scrapping with a huge wild hill loch monster. Having already managed to land a nice sea trout earlier in the week, all his dreams had come true, and all boxes well and truly ticked. If that wasn’t enough, a few cast later he was in to another. Some of these hill loch fish are so dark, nearly black, and this one looked a little like a tench! For most parts of the UK, April is too early for fishing for sea trout in the salt. Always on the look out for activity, and desperate for a guest or two to experience what it is like to catch one on the fly in the salt, we headed to a couple of favourite spots. Catching sea trout is never guaranteed, fishing for them can be frustrating and many hours drift away which could be spent fishing for brownies. Most guests however managed a fish or two, one lucky chap caught more than a few! None of our guests come to Islay without experiencing the incredible whiskies distilled here. During the week our guests tried some stunning Islay drams. Bunnahabhain 12 year old went down particularly well, a bottle being ever-present on the mantlepiece. Our guests from Moscow very kindly presented us with a single cask Bowmore 17 year old bottled by the SMWS. Probably the best single cask Bowmore I’ve ever tasted! As always, evenings were spent tying flies in front of the fire and enjoying a dram or two, accompanied by one or two of Glen Pointon’s infamous anecdotes. Perfect. Welcome to Fly Fish Islay! We arrange bespoke Guided Fly Fishing Experiences for groups of anglers on the beautiful and magical whisky Isle of Islay in the Southern Hebrides, Scotland. 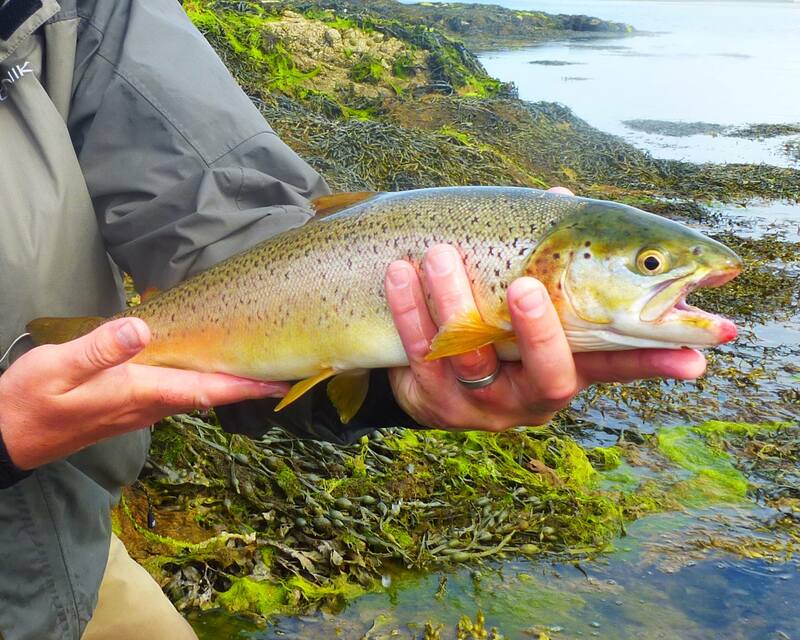 Islay is one of the best places in the world to fish for the wildest of brown trout and for the hard fighting sea trout. The island is famous for whisky and wildlife as well as for the fishing. A visit to Islay is often a life changing experience, not least for your guides, David Wood and Doug Ross. If you would like to get in touch to enquire about our bespoke guided fly fishing experiences on the magical whisky Isle of Islay please don’t hesitate to call David Wood on 07875 405 980 or send an email to david@flyfishislay.co.uk. We have a number of scheduled Guided Islay Fly Fishing Experiences arranged for 2018. The next trip that we have spaces on commences on Saturday 12th May, please contact us if you would like to enquire or to make a booking. We can arrange daily guided fishing on many lochs on Islay, we can also provided fly fishing tackle and tuition. Please contact us if you would like to enquire about guided fly fishing for trout or to make a booking. We also host Guided Islay Distilleries Experiences for groups of whisky enthusiasts, for more info about this have a look at our sister website www.distilledevents.co.uk. We would love you to join us so please do get in touch. We host Guided Fly Fishing Experiences on the Scottish Island of Islay in the Southern Hebrides. We schedule trips throughout the season and we also arrange bespoke trips for small groups of anglers who wish to stay with us for a few days on Islay. Wearrange bespoke Guided Islay Fly Fishing Experiences for private groups any time during the fishing season. Our guides offer tuition for anglers new to the sport, and show you how to fish a loch or river and how to tie fly patterns. Fly fishing for wild brown trout, sea trout, and salmon. For more information please call David Wood on 07875 405 980 or go to our ‘Contact Us’ page to send an email.